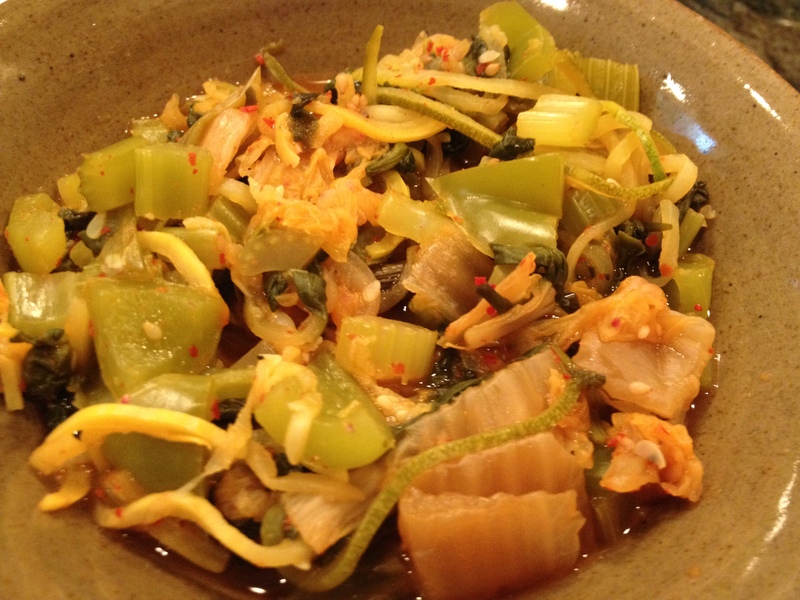 The kimchi combines perfectly with the vegetables in this dish for a great hot and sour soup. I came up with this recipe when I was searching for something to do with a bunch of leftover zucchini spirals besides mixing them with marinara. (My usual go-to). All of the sudden, my eyes landed on the big, plastic container of kimchi in my refrigerator. Eureka! It had delicious soup possibilities written all over it. If you’ve never heard of or tasted kimchi, it’s a fermented Korean staple that can be eaten by itself, as a garnish or in soups, stews and rice dishes. It’s basically a spicy sauerkraut. Traditionally, Korean kimchi is made with fish sauce, but many American brands are vegan. I used the Korean Kimchi from wildbrine in this recipe. It has Korean red chilies, napa cabbage, sea vegetable, green onion, toasted sesame seeds, salt, garlic and ginger in it. It’s also the only kimchi I’ve had, so I don’t have a lot to compare it to. For me, it’s a pleasant blend of sour to spice. I could see it being too spicy for some people, though. Moreover, I think pairing the kimchi with the zucchini noodles and veggies helps to tone down the spice level of it. If you have sesame oil on hand, I’d try sautéing the vegetables in it for additional flavor. Next time I’m planning on trying that. I also used spinach because that’s what I had, but you could substitute bok choy or kale as well. In a small soup pot, add the water, celery and green pepper to a boil. Season lightly with salt and pepper. Cook on medium heat for 4-5 minutes or until they begin to soften. Add spinach and cook until it wilts into the other veggies. Then toss in the zucchini noodles. Cook them for only a minute or two, and reduce heat to low. Be careful not to overcook the zucchini or they will start to disintegrate. Pour in the kimchi and stir until combined. Bring back to a slow boil for a minute or two. Then reduce heat to simmer. Once it cools, you can taste it to decide if you need more salt or pepper. Depending on what the kimchi has in it, you may or may not have to add any more.